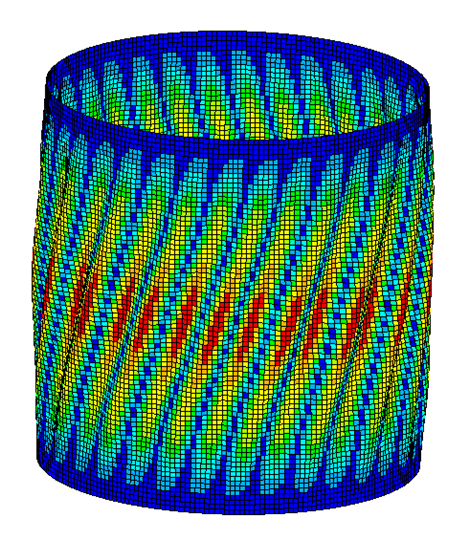 ESAComp can be used for designing straight and conical composite tubes with a circular cross section. The performance of the structure can be studied under various condition. ESAComp provides an extensive data bank for commercial material grades. Laminate designs can be based on the readily available materials or the user can define his/her own material systems. In ESAComp, the model creation is easy and fast. The engineering effort can be directed to laminate design rather than finite element modeling. The benchmark study  involves the stability analysis of an axially loaded thin-walled composite cylinder. The linear static analysis results of ESAComp correlate very well with the published data. Hühne C. et al., A new approach for robust design of composite cylindrical shells under axial compression, Proceedings of the European Conference on Spacecraft Structures, Materials & Mechanical Testing 2005, SP-581 - September 2005.